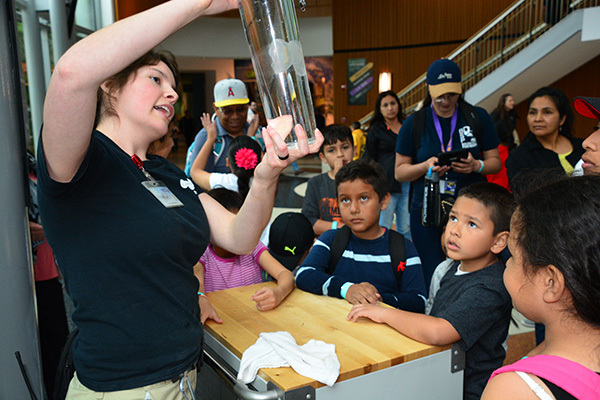 On Sunday, April 29, 260 children and their families from CHISPA partners Building Skills Partnership, El Sol Academy, New Economics for Women, and Para los Niños enjoyed the day exploring the diverse exhibitions at the California Science Center. 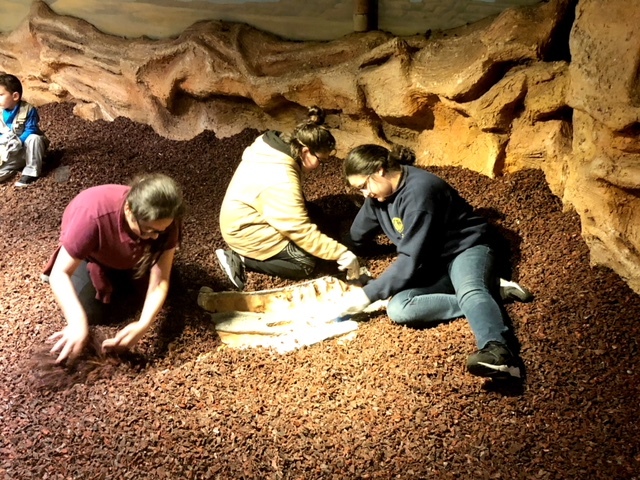 The schedule included the Animal Meet and Greet, Dive Show and Aquarist Talk in the Kelp Forest, the Endeavor and the Air and Space Exhibit, Slime (of course! ), Body Works Show, and more. Thanks to Norberto Oropez and the CHISPA team at California Science Center! On Thursday evening, April 19, and Saturday, April 21, 2018, the Chicago Children's Museum hosted CHISPA Family Science events for their CHISPA partners, including Brighton Park Neighborhood Council, Gads Hill, Aspira of Illinois, and Instituto del Progreso Latino. Parents and children of all ages had a great evening exploring the museum's exhibitions. 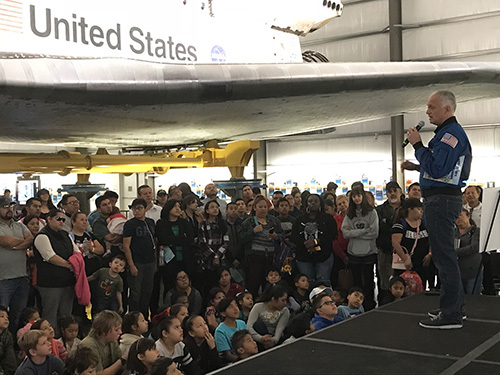 On December 9, 2017, former astronaut Dr. Danny Olivas provided an amazing opportunity for CHISPA families to hear about space travel. Just under 300 people from CHISPA partners Building Skills Partnership, El Sol Academy, New Economics for Women, and Para los Niños attended the special event and the word of the day was "AWESOME!" Each family received an autographed copy of Danny's book, The Endeavor's Long Journey, which he translated to Spanish, and had the opportunity to meet him one on one. Click here to read more about Dr. Olivas. 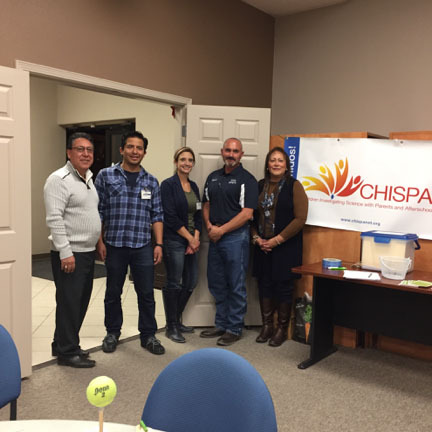 Tularosa and Deming are small towns located about three hours from Albuquerque, NM, where CHISPA partner Explora is located. They are two of the communities served by CHISPA partner HELP NM. That’s a long drive for families to get to a science center, so Explora and HELP NM worked together to plan and host two remarkable CHISPA Family Science events on November 29 in Tularosa and on November 30, 2017 in Deming. In Tularosa, the Explora team, led by Andres Barrera Guerrero, took several exhibits and activities for the event, and worked with Maria Farias, HELP NM staff member, to welcome 62 children and parents to spend an afternoon exploring science. Pizza and snacks were enjoyed by all. The next day the Explora team went to Deming, and 69 children and their families spent the afternoon together investigating and engaging in STEM. Crystal Pena, HELP NM Area Coordinator and CHISPA lead CBO partner, provided door prizes, and she and her team cooked hot dogs and hamburgers for everybody. Deming Mayor Benny Jasso and Crystal Pena were the featured speakers, inspiring families to support their kids dreams and to convert small events in great opportunities for learning and progress. Crystal shared the joy she felt at seeing families working together with Explora and supporting CHISPA, and Mayor Benny encouraged the attendees to challenge themselves to reach their goals. Cheryl Lani Juárez, CHISPA PI, provided a project overview and shared the CHISPA Overview video. Next, Mariah Romaninsky, Academy of Natural Sciences of Drexel University, shared her thoughts from the perspective of a museum practitioner. Jose Rodriguez, Director, Parent and Community Engagement, UnidosUS, described the implementation and impact of the Padres Comprometidos con CHISPA project component. Cecilia Garibay, Garibay Group, presented preliminary insights from the project evaluation. Following small group discussions and large group share-out related to organizational capacity and linkages between museums and Hispanic community organizations, participants viewed The CHISPA Journey video. Click here to download the ASTC presentation.